Yale University Press, 9780300223989, 304pp. 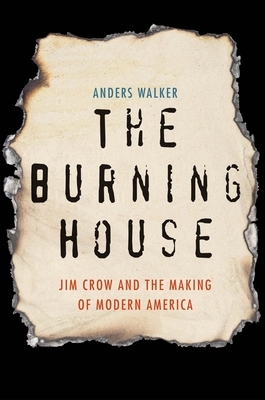 In this dramatic reexamination of the Jim Crow South, Anders Walker demonstrates that racial segregation fostered not simply terror and violence, but also diversity, one of our most celebrated ideals. He investigates how prominent intellectuals like Robert Penn Warren, James Baldwin, Eudora Welty, Ralph Ellison, Flannery O’Connor, and Zora Neale Hurston found pluralism in Jim Crow, a legal system that created two worlds, each with its own institutions, traditions, even cultures. The intellectuals discussed in this book all agreed that black culture was resilient, creative, and profound, brutally honest in its assessment of American history. By contrast, James Baldwin likened white culture to a “burning house,” a frightening place that endorsed racism and violence to maintain dominance. Why should black Americans exchange their experience for that? Southern whites, meanwhile, saw themselves preserving a rich cultural landscape against the onslaught of mass culture and federal power, a project carried to the highest levels of American law by Supreme Court justice and Virginia native Lewis F. Powell, Jr.
Anders Walker shows how a generation of scholars and judges has misinterpreted Powell’s definition of diversity in the landmark case Regents v. Bakke, forgetting its Southern origins and weakening it in the process. By resituating the decision in the context of Southern intellectual history, Walker places diversity on a new footing, independent of affirmative action but also free from the constraints currently placed on it by the Supreme Court. With great clarity and insight, he offers a new lens through which to understand the history of civil rights in the United States. Anders Walker teaches law and history at Saint Louis University and is the author of The Ghost of Jim Crow: How Southern Moderates Used Brown v. Board of Education to Stall Civil Rights. “Anders Walker provocatively explores how and why a star-crossed array of white and black southern writers seriously probed and delivered a critique of racial integration. He goes where most literary historians have not gone: to the ironic, complex zone of imagination on both sides of the color line among many of America's greatest writers. This work is a must read for those interested in questions around race, modernism, and pluralism.”—David W. Blight, Yale University and author of Frederick Douglass: American Prophet.